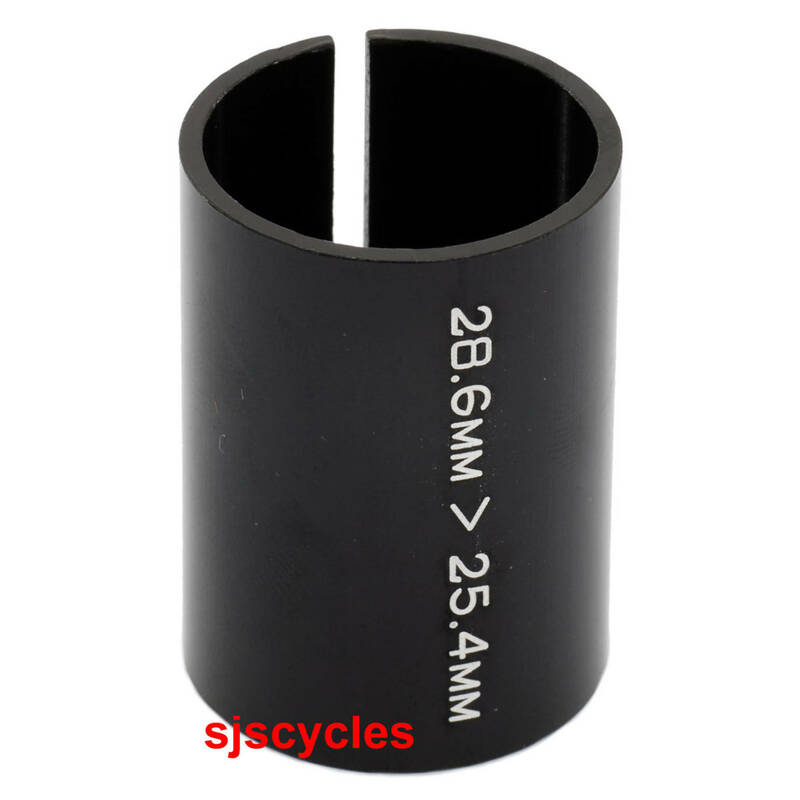 A split aluminium shim that fits over a 25.4mm (1 inch) steerer tube changing the outer dimension to 28.6mm (1 1/8 inch). Allows the use of a stem designed to fit 1 1/8 inch steerer tubes where greater choice is available. Black anodised finish with laser etched detail. Ahead Stem Shim 1 To 1 1/8"
purchased to aid replacement of old quill stem & road handle bars The ahead stem shim enabled the use of a modern 1 1/8th stem. Fantasic service & speedy delivery from SJS. The ahead shim does the job it is intended to do very nicely. I wanted a slightly less upright riding position on my hybrid so set about gathering up the parts. The quill stem adaptor had to be black to keep the look for the bars and stem I got were black. The adaptor, being 25.40mm diameter, needed a shim to allow the new stem to fit. The 25.40 to 28.60mm shim was the perfect solution. My bike looks and rides much better now. Having to replace my old 1 1/8" threaded forks after nasty altercation with a Merc I bought myself some lovely carbon forks which had a 1" steerer stem. I easily sourced the headset but needed a shim to fit my stem and this was the best option. Just what I needed. I was replacing an old quill stem 1" threaded headset with a threadless adapter in order to have more choice, but this gave a 1" stem. So a shim was required to use 1 1/8" stems. This worked perfectly, fitting the stem adapter and the stem very snugly. Just the thing to allow the use of a normal 1 1/8th stem with a 1 inch fork steerer. Really useful and allows a much greater choice when choosing a stem or allows the use of modern fair with an older bike. Ideal for that restoration! One thing to be aware of...you may still need to use a 1 1/8th top cap if you want to hide the shim. A 1 inch top cap allows it to peep through! Do these cause squeaks or creaks under loading? Unfortunately, we would have no idea as we have never tested one of these I'm afraid. Yes you would still need a headset. How Long Is This Shim? This shim is 40mm in length.